March 2000: Released their first single “Kronos” from Escape Records label. 2001: Released their fourth single “REMEMBERANCE” from PLUG RECORDS label and gains popularity for their live tour shows, in which tickets were sold out in a day. They also released one greatest hits album and two original albums. October 2002: Released their first major label single “Ai no Uta” from Nippon Crown Record label and makes their first appearance on the Oricon Single’s chart, ranking No.10. 2003: Released their second single “Gekiai Merry-Go-Round / Shunkashuutou” in January (ranks No.8 on Oricon Single’s chart) and a cover single of Kome Kome Club’s song “Roman Hiko” (ranks No.11) in April, which drew more fans, and gained more popularity as a cosplay band. In May, under the stage name “Saikoro Korokke”, they released a double A-side single “Miracle High Tension!”, being the opening song of the TV Tokyo channel anime “Croket!”, and “VISITOR”, being the ending song. In September, they released their first album “FRONTIERS” (ranks No.6 on Oricon chart). Before the band takes a break from June 2005, they released seven singles and two albums from Nippon Crown Record label. Their attractiveness lies behind their unique conceptual live performances. They turn their concert into an entertainment show, dancing and acting, wearing various cosplays such as space pirates and Momotaro, a Japanese folklore hero. Their entertainment style became popular among overseas countries and the show they held in the United States, in 2004, was a great success. They were also chosen as one of the Newsweek Japan’s “100 Most Respected Japanese People in the World” (October 20, 2004 issue). They have also appeared on Fuji Television’s TV program “Domoto Kyodai”. After taking a break from June 2005, they made a comeback in 2006 and took another break at the end of the year, making another comeback in 2009. Band members Lida and YURA-sama joined and formed a duo band “Dacco”. 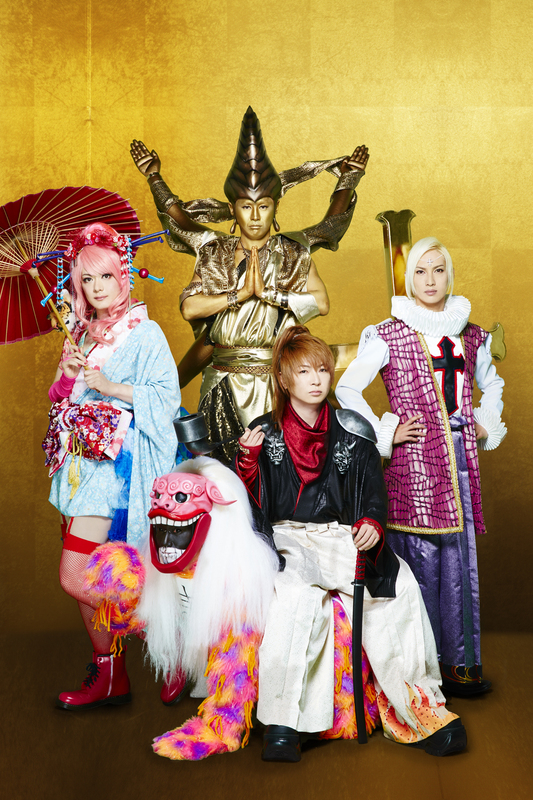 YURA-sama also joined other visual kei musicians and led a musical “Arasta”. AYA (guitar) and seek (bass) joined a rock band “Mix Speaker’s Inc.” and DAISHI (vocals) joined “SiXX”. October 2014: Held a 15th anniversary live concert “Psycho le Cému 15th Anniversary Live TOKYO PARALLEL WORLD”. February 2015: Performed three shows in Tokyo, at TOYOSU PIT and two days at Zepp DiverCity. Tickets were all sold out in one day. The show held at TOYOSU PIT was later aired on WOWOW television channel in April and re-aired in May. September 16, 2015: Released a single “Akiramenai DAYS” in three versions (ranks No.26 on Oricon chart). This was their first in 3794 days to release a new single. September to October 2015: Commemorating the release of “Akiramenai DAYS”, they held in-store events at nine places. They also held a two-day concert entitled “TOKYO MYSTERY WORLD -Meitantei D to Yonin no Kaitou-tachi” with a different setlist for each. The first of the two-day concert, “FILE 1 Yozora ni Mau Kaitou”, was held on October 2 at Shinagawa Stellar Ball, and the latter, “FILE 2 Nusumareta Kuronosu”, on October 3 at TOYOSU PIT. January 17, 2016: They participated at the “J-MusicLAB in Taipei” festival in Taiwan, organized by Nippon Rekodo Kyokai (Recording Industry Association of Japan). This became their first show to perform overseas in Asia. January 23 and 24, 2016: Held a two-day concert, “Legend of sword 2016 – Densetsu wa Futatabi” and “Ooedo Karakuri WORLD -Shin-Ishou Ohirome Kouen-” at TOYOSU PIT. May 25, 2016: Released two versions of a double A-side single “Ooedo Tabigarasu / Kiseki wo Shiru Bokura wa Gosenfu ni Saku Kibou wo Utau”. The first limited edition includes their first in 10 years’ video production, the DVD of the “Ooedo Karakuri WORLD -Shin-Ishou Ohirome Kouen-” concert held at TOYOSU PIT in January. July 7 to 10, 2016: Scheduled to participate at the 17th JAPAN EXPO, which will be held at the Paris Nord Villepinte convention center in Paris, France.